There have been numerous articles pertaining to Cubs and Scouts. 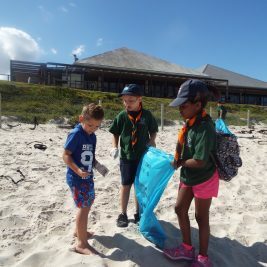 It is now time for all to have a better understanding of Rovers, as it is the third branch of Scouting in South Africa. The makeup of a Rover Crew is slightly different to that of a Pack or Troop. Firstly a Pack or Troop is under adult supervision, whereas a Crew in under the guidance of a Rover Scouter. A distinct difference! Secondly, The Crew elects a Crew Council that will decide on strategy for the Crew, whether it is Crew activities or Service projects. A typical Crew comprises between 6 to 12 members. Also, a Crew does have a fair amount of autonomy when it comes to Crew programme, Service projects and Crew finances; but they do have to report to the GS or DC for compliancy. What is unique with each Crew is that they have their own Crew Constitution that defines who they are and how they operate. From a South African perspective, Rovering was quite active up to the 1980s, but there was a significant decline in the 1990s due to fact that most Crews were operating without a Rover Scouter and there was no real structure to the Rover programme at that time. At the time when I took the position of National Commissioner Rovers, there were only 124 Rovers in the country. The Chief Scout at that time basically said to fix it or Rovers as a branch could be terminated. In 2004, the upper age limit of 35 was implemented, then from 2008 the Rover programme was completely overhauled. However, the significant difference was that Rovers were directly involved in the compilation of this new programme, and this was a positive move to get the buy-in of Rovers. Numerous drafts were circulated and consultation occurred with Rovers from Nelspruit to Cape Town. Finally the programme was accepted at the 2011 NSC. As a result from the new enthusiasm towards Rovers (and the new programme), the number of Rovers has steadily been increasing around the country. From the last census, there are now 619 Rovers in the country. Rover meetings are held at Rover Dens, where they can cover topics or activities from car mechanics, archery, mountaineering techniques, current social issues and scouting skills. Crews have also been known to have hiking adventures in the mountains, rafting down rivers and even (quite extreme) having a holiday in Mauritius. Rovers (and Crews) make their own decisions on what activity they will undertake. Besides the adventures described above, Crews also undertake Service projects that benefit the Movement (Cubs & Scouts) by organising or assisting at competitions; or the Community like painting farm schools, working at old age or children’s homes. The indifferent stigma that Rovers had in years past has all but gone, and now with a well-defined Rover programme, the third phase of training will ensure that those leaving Scouts (and others) continue on their path of becoming useful citizens in our country. You learn things you never knew before!